Battle Arena Melbourne returns in its eighth iteration! 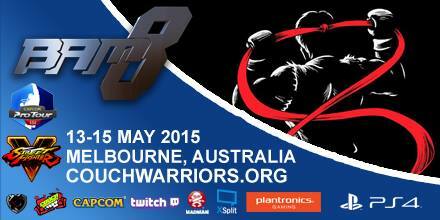 BAM8 will take place on May 13-15, 2016 at the CQ hotel in the Melbourne CBD and promises to be our biggest BAM to date – with BAM8 officially becoming a Ranking Event on the Capcom Pro Tour. By earning Ranking Points at BAM8, OHN14 and other Capcom Pro Tour Ranking Events, competitors can qualify for a place in the prestigious Capcom Cup Finals at the end of the year. In addition, winners of Street Fighter V at each event will be sent to the Capcom Pro Tour Asia Finals in South Korea; the winner of this CPT Premier event will earn a direct qualification to the Capcom Cup Finals! BAM8 is also a Worldwide Tournament Qualifier for Team Ninja’s global DOA5LR event, Battle Royal 2016! Team Ninja are supporting this tournament with a $1,000 Prize Bonus. The 1st place winner of Dead or Alive 5 will receive travel and accommodation at December’s NEC XVIII finals in the USA. We’ve grown from strength to strength over the year with BAM7 being the biggest BAM so far – with 628 registered attendees and a huge plethora of Smash internationals like two time EVO champ Mango, Leffen, Wife, Alex19, Hugs and former EVO champion Perfect Legend coming down to take the Mortal Kombat X crown. The Melbourne community is proud to host a national platform for players across the country to come together and compete. As always there will be plenty of free-play and casual setups for players looking for practice or just for fun outside the tournament action. Of course, players will be hungry for glory and one of the iconic BAM boxing glove trophies. http://couchwarriors.org/wp/bam8/bam8-registration/ (Pre-registrations will be open until Saturday May 7th so be sure to get in before then to secure the discounted venue fee of $40. On the day rego will be $50. Registration for Smash WiiU and Melee is pre-registration only. All other on-the-day registration for games must be done one hour before the game’s first pool starts. Street Fighter V and IV players, this means if you want to sign up on-the-day you must do so on FRIDAY. Entry Fees: $10 per tournament game plus venue entry of $40/$50. Check out the BAM7 Photo Gallery here. – Taking on the whole CQ venue, all function rooms open. – A huge range of Super Smash Bros guests! 4 International Smash pros: Umeki, 9B, Abadango and Mr. R appearing thanks to a community funding drive with more likely to come! – Worldwide Tournament Qualifier for Team Ninja’s global DOA5LR event, Battle Royal 2016. Team Ninja are supporting this tournament with a $1,000 Prize Bonus and the 1st place winner of Dead or Alive 5 will receive travel and accommodation at December’s NEC XVIII finals in the USA. – $500 Pot Bonus for Smash 4 and Melee for top 3 Australian players! – $500 Pot Bonus for Street Fighter V! -BAM8 Afterparty! Sunday night 10PM-3AM at The Crafty Squire (127 Russell Street). Drinks till late, Setups for drunken team matches/moneymatches, Def-P deejaying…hope to see you guys there! CouchWarriors is proudly partnering with New Game Plus, a Twitch Partner channel, as the BAM8 media and streaming partner. BAM discounted hotel rooms at the CQ!